Standing Liberty Quarter Key Date Review: Rare Coins That Continue to Climb. From the very earliest days of the U.S. Mint, tradition held that all silver coinage carry the same basic design. This all changed dramatically in 1916, when the Dime, Quarter, and Half Dollar all began touting distinct themes. Mint Director Robert Woolley wrote the above regarding the historical change and captured the sentiments of the nation when he included the above in his 1916 annual report. 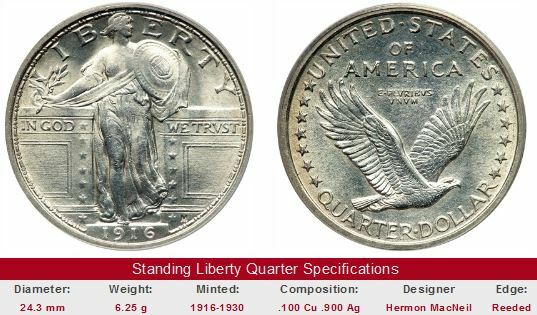 The Standing Liberty Quarter was designed by Hermon MacNeil, whose work was selected from among many entries submitted during a public competition. During this time, Europe remained gridlocked in a devastating conflict, generating news headlines around the world. When the government announced plans to replace the stoic Barber Quarter with a new design “…intended to typify in a measure the awakening interest of the county to its own protection”, the public cheered. As the Great War raged in far away places, MacNeil's depiction of Liberty holding an olive branch and a shield was meant to signal America's interest in peace but readiness to fight, if necessary. War bound or not, the Standing Liberty Quarter issued notice to the Europeans that America stood watchful and ready. US Coin Values Advisor has completed Coin Value Tables for the Standing Liberty Quarter, reporting retail price trends over a long period of time for individual coins of this magnificent series. The Standing Liberty Quarter on the left is absent of full detail in the head. Contrast this to the quarter on the right, where all head details are present. Both coins are Type 1 Standing Liberty Quarter high grade Mint State Uncirculated specimens. To qualify for a Full Head designation, Type 1 quarters must have full details in Liberty's hair, a complete hairline along Liberty's face, a visible eyebrow and a rounded cheek. Type 2 Full Head quarters must have three well defined leaves in hair, a complete hairline along brow and across face, and a small indentation at ear. The cause of the the missing head details is due to insufficient metal flow into the recesses of the die, influenced by design elements directly opposite on the reverse also competing for metal flow from the planchet. The first Standing Liberty Quarters were struck on December 16, 1916. Only 52,000 of them were made before the end of the year. Just a few months into 1917, public disgust over Liberty’s bared breast sent Mint engravers scurrying to the drafting board, where they quickly devised a blouse to clothe Liberty’s offending anatomical attribute. Also, to ease the mechanical aspects of the minting process, the eagle and stars were slightly repositioned at the same time. Beginning in 1925, the date was recessed deeper into the coin to protect the numerals from premature wear. Coin collectors crave Standing Liberty Quarters. Much attention is directed to the amount of visible details in Liberty's head. While the design was an aesthetic success, it also caused difficulties in striking, despite attempts to correct the problem. Consequently, relatively few specimens emerged from the Mint with full head details. Because of their scarcity, particularly for certain dates, coin buyers are willing to pay very high premiums for "Full Head" examples. The 1916 and the 1918/7-S overdate are on everyone's list of blue chippers. The 1923-S and 1927-S might surprise a few people. The 1923-S has a long record of substantive value growth and deserves to be listed here, while the 1927-S may be a sleeper just beginning to arise from its slumber. These key date Standing Liberty Quarters can often be found at online coin auctions on eBay. Because these coins have long been so popular with collectors, many swindlers, past and present, have attempted to capitalize on this fact. Do not buy these rare coins, or any rare coins for that matter, unless they've been certified by one of the grading services trusted most by knowledgeable collectors: PCGS, NGC, ANACS, or ICG. There are other grading services, but too many of them have less stringent standards. Legions of inexperienced collectors have been burned because of them, so it is safer to stay away. The left hand side of each "Sales Box" is value trend data over a very long period of time for the date headlined, in G-4 condition. The percent annual increase is computed for comparative purposes. If no coin shows up on the right hand side, this means at the moment, no example of the date is for sale on eBay. Check back later. The coin pictured for sale in the right hand side (if any) is not necessarily an example in G-4 condition.